A staircase makes a great impact, serving as a focal point and setting the overall scene for its space. 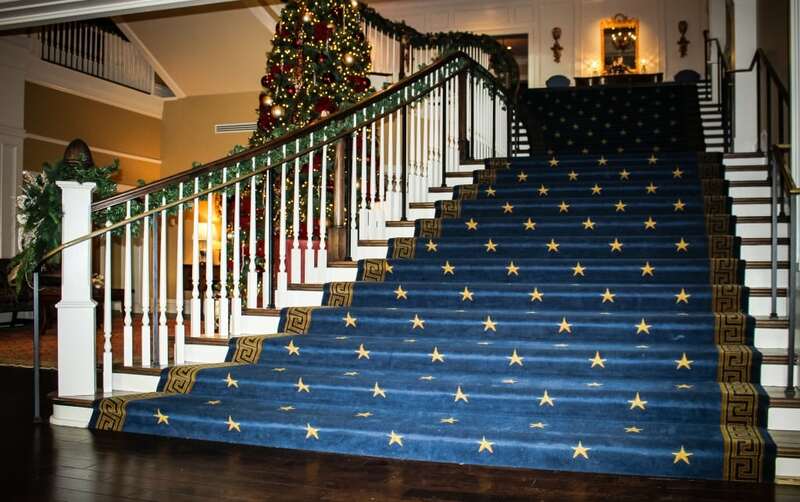 With the ability to make such an impression, it is no surprise that custom stair design has played a large role in many films throughout history. Last week, we featured three iconic staircases from popular films from 1939 to 1991. This week we continue our discussion of Hollywood stair design with a familiar scene from 1997. When asked to name a film featuring a famous staircase, many people will reference the beautiful and ornate staircase from “Titanic.” Built to replicate the actual ship’s stair design, the curved stair features a luxurious flare, showcasing the ship’s high-end architecture. With a balcony system featuring ornate wrought iron railings, paired with custom wood accents, this staircase is truly a grand design. The striking staircase is included in many of the film’s scenes, including several of the romantic nature. The elaborate stair design supports several themes of the film, including the juxtaposition of the wealthier passengers’ accommodations and gathering areas versus the lower class decks where others, including Leonardo DiCaprio’s character, Jack, were housed. The staircase also served as a symbol of the emphasis on style over function in the ship’s design, as the luxury ship was stunning, yet ill equipped to ensure the safety of its passengers. 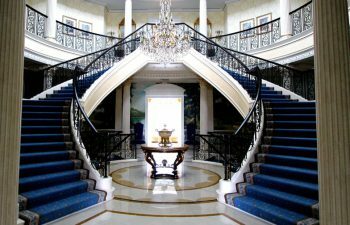 While the “Titanic” and other Hollywood stair designs are truly iconic, “real life” staircases can be just as striking. Our industry-leading team possesses the creativity and capabilities to make a lasting impression through each of our residential and commercial stair design projects. Inspired by these Hollywood staircases, we would like to share two of our favorite projects that demonstrate the ability to set a memorable scene outside of film. First, we circle back to a previous post to highlight The Columns of Rome. 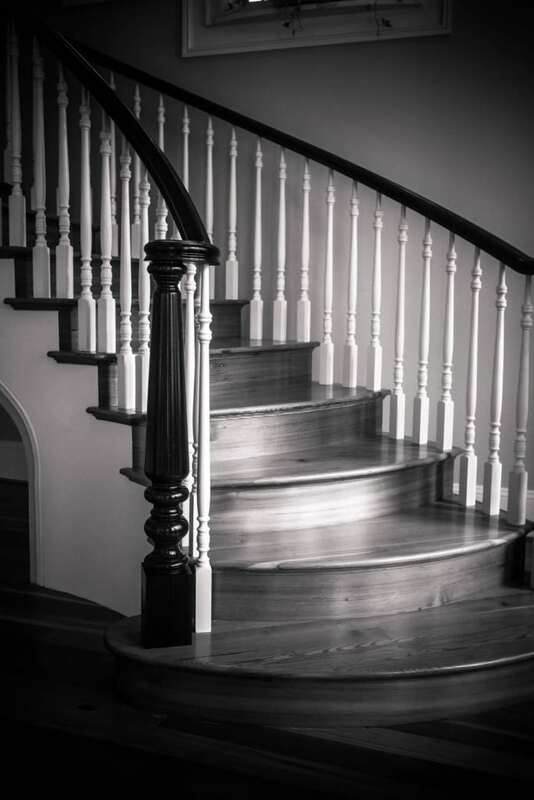 This circular stair design is classic, featuring elegant features with Hampton balusters and Belle Meade newels. 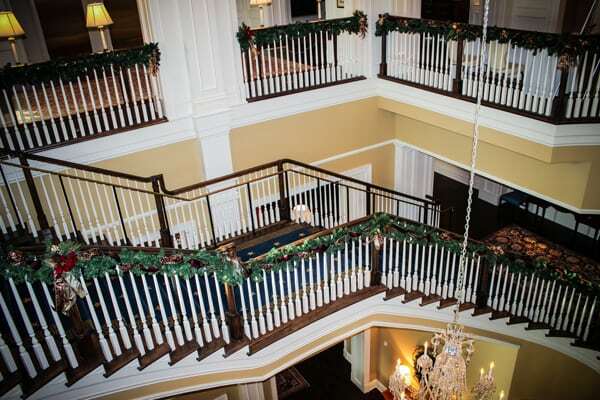 Creating a luxurious feel within this Georgia residence, the beautiful stair design is the true essence of Southern charm. Our second feature is a monumental commercial stair design project. Elegant and breathtaking, this stair features a unique combination of straight and curved segments, balconies, and landings. Classic in style, the system is complex, flowing seamlessly from one level to the next with beautiful aesthetic quality. The stair’s robust wooden baluster system completes the stair design, offering classic beauty, quality, and safety. Are you looking to make a statement and lasting impression within your space? Our team leverages industry experience and extensive capabilities to design and deliver innovative, film-worthy staircases across the nation. Whether commercial or residential, modern or traditional, our team will bring your vision to life. Visit our commercial and luxury residential project galleries for additional details and pictures on our exquisite projects. From inspiration to installation our team is committed to designing and building the highest quality custom staircases. Our reputation speaks for itself and client satisfaction is our highest priority. Contact us today to discuss your next custom stairs project.